The metropolitan area of São Paulo is home to approximately 21 million people or about four times the population of Norway. Among the largest cities in the Americas, Sao Paulo alone is home to approximately 12 million people. In a city which, according to Forbes Magazine, has among the largest concentrations of billionaires in the world, it is estimated that 45 000 families live in occupied buildings with little or no infrastructure and safety. According to official data from 2015, 16 000 people live on the streets of São Paulo, but representatives of homeless organizations say the real number is more than 30 000. Those living on the streets have different life stories and different reasons to be there. Some of them work, others are unemployed; some of them have families, others are alone; some of them suffer from serious illnesses, others are relatively healthy; some of them are there because they prefer the streets to the shelters provided by the municipalities, others because they have no other place to go. For those without a home, access to clean water for drinking, making food and personal hygiene is a constant challenge. Homeless people often use public toilets for this purpose, and many collect water from gutters, sewage pipes, or rain. In São Paulo, only some public libraries, shelters, parks and toilets offer drinking fountains and taps of clean water. Until very recently, people living on the streets of the city center used to count on the goodwill of those working at restaurants and bars to access drinking water. However, as a result of a series of factors such as the marked reduction in rainfall, warmer temperatures and the increase in the number of homeless people, there has been a change in the behavior of shopkeepers. Those living on the streets are now often denied even a glass of tap water. In addition, during the night, it is impossible to obtain drinking water anywhere, except in official shelters which do not always have enough places for all who need them. 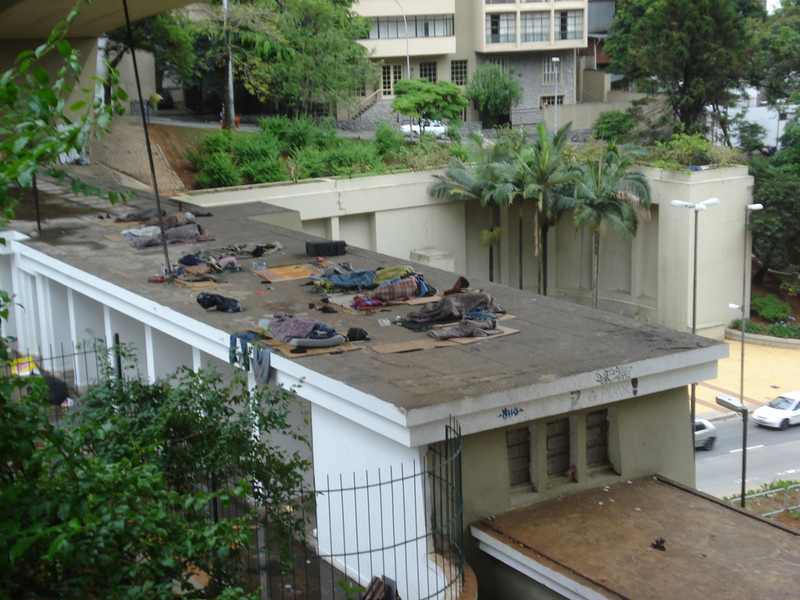 Robson Mendonça, the president of the MSTSP, a movement of homeless people in São Paulo, refers to this situation as a violation of human rights and of the dignity of homeless people. The movement has coordinated campaigns for the donation of bottles of mineral water to homeless people, but such campaigns are of course insufficient to solve a problem which in reality has deep structural causes. The MSTSP is in dialogue with the city council through the Commission of Human Rights and Citizenship to find a solution to the lack of drinking water of homeless people in the center of São Paulo. Last February they applied for the installation of public fountains in key points in the city center. Their demand is modest: they are asking for eight fountains. They have also asked for chemical toilets to be installed. Robson Mendonça is an activist. He lives in a small flat in the center of São Paulo and has a storehouse under an overpass that was granted to him by the municipality. He dedicates his life to the defense of homeless people. Much more than the president of the movement, Robson appears almost to be the movement himself. He represents people living on the streets in meetings with city authorities and is also in frequent contact with members of state agencies in charge of social rights’ defense and legal defense for those who cannot afford it (the public prosecutor’s office and the public defender’s office). People living on the streets often take a shower and eat at his place. Robson empathizes with them. He was a homeless himself in the past, when a series of difficulties made him move from the south of Brazil to São Paulo. Today he lives of donations and a small remuneration received by the municipality for his work as a homeless representative. The movement’s submission in February was not the first initiative with this scope at the municipal level. In August 2018, a bill was proposed before the city council for the installation of public fountains in the main squares and bus terminals of the city as an important measure to promote public health. The bill made an explicit reference to homeless people. But there is no need of a law for the installation of the fountains. Support from the Secretary of Human Rights or the Secretary of Social Assistance and the inclusion of the project on the city budget would be sufficient. However, there is clearly a lack of coordination of these initiatives, and there is also a chance that a public policy is already in place in this area that is not being implemented. The UN calls for leaving no one behind. Whether the movement will be successful or not is still an open question, but we can be sure that Robson will keep fighting. This entry was posted in Elevating water rights to human rights: Has it strengthened marginalized peoples' claim for water?, Natural resources & climate lawfare on March 22, 2019 by AnnaG.